IRVINE, Calif.--(BUSINESS WIRE)--Mar. 7, 2019-- CoreLogic® (NYSE: CLGX), a leading global property information, analytics and data-enabled solutions provider, today released the Home Equity Report for the fourth quarter of 2018. The report shows that U.S. homeowners with mortgages (which account for roughly 63 percent of all properties) have seen their equity increase by 8.1 percent year over year, representing a gain of nearly $678.4 billion since the fourth quarter of 2017. Additionally, the average homeowner gained $9,700 in home equity between the fourth quarter of 2017 and the fourth quarter of 2018. While home equity grew in almost every state in the nation, western states experienced the most significant annual increases. Nevada homeowners gained an average of approximately $29,400 in home equity, while Hawaii homeowners gained an average of approximately $26,900 and Idaho homeowners gained an average of $24,700. California homeowners experienced the fourth-highest growth with an average increase of approximately $19,600 in home equity (Figure 1). From the third quarter of 2018 to the fourth quarter of 2018, the total number of mortgaged homes in negative equity increased 1.6 percent to 2.2 million homes or 4.2 percent of all mortgaged properties. This was the first quarterly increase since the fourth quarter of 2015. Despite that quarter-over-quarter increase, on a year-over-year basis, the number of mortgaged properties in negative equity fell 14 percent, or by 351,000, from 2.6 million homes – or 4.9 percent of all mortgaged properties – in the fourth quarter of 2018. Negative equity, often referred to as being underwater or upside down, applies to borrowers who owe more on their mortgages than their homes are worth. Negative equity can occur because of a decline in a home’s value, an increase in mortgage debt or both. 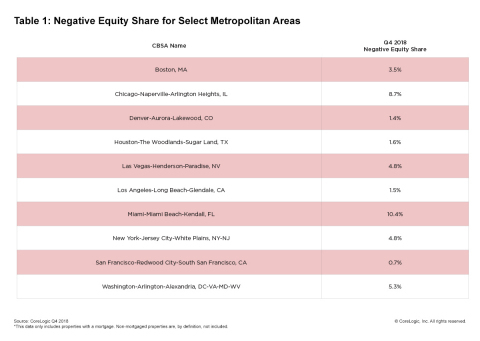 Negative equity peaked at 26 percent of mortgaged residential properties in the fourth quarter of 2009, based on the CoreLogic equity data analysis, which began in the third quarter of 2009. The national aggregate value of negative equity was approximately $300.3 billion at the end of the fourth quarter of 2018. This is up approximately $17.4 billion from $282.9 billion in the third quarter of 2018 and up year over year by approximately $14.4 billion from $285.9 billion in the fourth quarter of 2017. For ongoing housing trends and data, visit the CoreLogic Insights Blog: www.corelogic.com/insights-index.aspx.